Tom Snogles is the founder and owner of Sun Power Lawn Care, a Gainesville, FL electric lawn care and maintenance business dedicated to quiet and sustainable service. I like to say that my mission in business and in life is to improve my little corner of the world. That’s why I started Sun Power Lawn Care almost four years ago. I wanted to strive every day to promote clean energy and strengthen our local community. So, did we meet those goals in 2016? I’m proud to say that 2016 was a year of dramatic growth for Sun Power Lawn Care. We brought electric lawn care to more Gainesville properties and cut more emissions than ever before. It’s been an exciting year, and I know I have the Sun Power Lawn Care community to thank for it. I’m grateful to be building this business surrounded by so many Earth-conscious, supportive people. I can’t wait to see what 2017 has in store for us. Compared to 2015, we doubled our volume of lawn service accounts. Our clients are the lifeblood of our business – I’m proud and humbled to have hit this milestone. 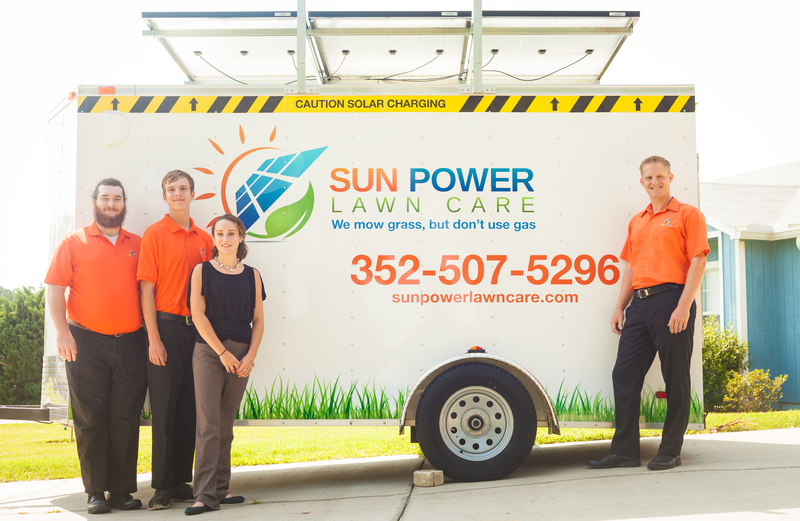 To meet the needs of our expanded client base, we tripled the Sun Power Lawn Care staff. We also significantly boosted our solar power capacity. None of this growth would be meaningful it if weren’t for our strong local network of sustainable businesses and consumers. If you know me, you know I’m always looking to find others in Gainesville who are committed to building a healthier and more sustainable world. We’re excited to have made connections with Shade Shifters, Doggie Styles, The Pool Guy Wes, plus some new relationships at McCall Service. When good things come to our business, we try to give back to our community. Over the course of 2016, we donated about $1,000 to Gainesville-based organizations, and lent our support to groups including the Child Advocacy Center and the Florida Springs Institute. This year brought plenty of scary moments to the Earth-conscious community, but also some bursts of light. There was the defeat of the solar-restrictive Amendment One here in Florida, and the recent halting (for now) of the Dakota Access Pipeline. To me, these victories are signs that grassroots efforts are the key to sustainable progress. We need dedicated people on the ground starting conversations and collaborative efforts to make our world a healthier, safer place for everyone. I hope we can carry the green attitudes and activism of 2016 forward into the new year. I think it’s important to weigh our growth with our growing pains – and we faced a few in 2016. This year taught me that my hiring process wasn’t streamlined. I had to hone in on a system and commit to it, so I could assess all candidates in the same way. I also had to find new techniques to become more accessible to my clients. That meant learning to prioritize tasks more efficiently and finding ways to answer every phone call. I’ve got my eye on big progress for 2017. I’m aiming to continue our client base growth and, with that, add more staff positions. The goal is not only to bring electric lawn care to more Gainesville yards, but also to help create sustainable jobs in our community. We hope you’ll join us as we move to even bigger and better things in 2017. You can stay in touch via our newsletter and Facebook, and you should always feel free to reach us directly with any questions or thoughts. Here’s wishing everyone a happy, healthy, and green holiday season.